Tony Austin, foreground right, portraying Gen. George Armstrong Custer, charges across the battlefield as Indians give chase during the Custer's Last Stand Re-enactment Friday west of Hardin. BILLINGS - A group of Northern Cheyenne storytellers gathered here Friday night to give for the first time an oral account of the killing of Lt. Col. George Custer and the defeat of the 7th U.S. Cavalry at the Battle of Little Bighorn. The event, held in conjunction with the High Plains Book Festival, drew nearly 200 people including Yellowstone Public Radio. It was, the story-tellers said, the beginning of a Northern Cheyenne project to make the tribe's version of the famous battle known. Frank Rowland, the night's emcee, said the tribe is now beginning to compile an oral history of the event. Rowland said the Northern Cheyenne had never publicly revealed their version of the battle. Fearing retribution after the fight in 1876, tribal leaders had called for a vow of silence. "The chiefs said to keep a vow of silence for 100 summers," Rowland said. "One-hundred summers have now passed and we're breaking our silence. This is going to be a first for the Cheyenne people and a breakthrough for Western history." In June 1876, Custer led 647 men with 7th Cavalry into the valley of the Little Bighorn River. The Cavalry and their Indian allies attacked the village of 8,000 to 10,000 people. After the battle, 263 U.S. soldiers had perished, including Custer, or Long Hair, as the Cheyenne called him Friday. "We've been told we were the villains of history," said Eugene Little Coyote. "No more. It's important for our young Cheyenne to know the truth. We want to share our history now." Steve Brady, a member of the Cheyenne Crazy Dog Society, said the Sand Creek Massacre of 1864 set the stage for what was to come at Little Bighorn. There, on the Colorado prairie, Col. John Chivington led approximately 700 U.S. soldiers to a Cheyenne and Arapaho village along the banks of Big Sandy Creek. A white flag flew above the Native village where the Cheyenne and Arapaho people believed they were living under the protection of the U.S. Army. The U.S. troops attacked and killed between 150 and 500 people, mainly women, children and elderly. Many Cheyenne chiefs were also killed, including Black Kettle. The U.S. troops paraded body parts of the fallen Indians through the streets of Denver and received a hero's welcome. "Our people had never seen such atrocities committed," Brady said. "It was the Western European who was supposedly here to tame the savages, which was us. This laid the groundwork of what was to come. My great-grandfather never forgot what they (U.S. troops) had done for the rest of his life." James Rowland, a Northern Cheyenne artist, said it was those bitter memories, mixed with visions by the Keeper of the Broken Arrows years later, which helped fuel the ferocity of the Battle of Little Bighorn. Rowland presented several art panels to the audience. Using traditional Native American imagery, each panel told a different moment of the battle according to Cheyenne history. The images were printed over old newspapers which once told the country how the "Indians" had overwhelmed and defeated the U.S. Army. "I had read several books, but things didn't add up until I heard the Cheyenne version," said Rowland. 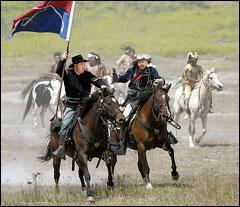 "Custer was spotted riding north while the battle was raging on the field." Stories passed down among the Northern Cheyenne say Custer died a mile away from the current monument that sits upon the knoll overlooking the Bighorn River. The storytellers, including Rowland, attributed Buffalo Calf Trail Woman for delivering the blow that knocked Custer from his steed before he died. "We know from history Custer had two wounds," Rowland said, referring to Custer's head wound and the wound to his chest. "When he fell, he wasn't touched by the warriors because he was unclean. He was bad medicine." It was the women, Rowland said, who took their revenge. Clarence Spotted Wolf said his great-great-grandfather fought bravely at the battle, where he lost his left eye. "He had two boys with him," Spotted Wolf said. "He went around and made a circle to get to Custer. He went down to his knees. They made a pass at him and said 'He's going down to his knees.' "
Frank Rowland said the Northern Cheyenne are collecting such oral accounts, which they hope to make public later this year. "This is just a platform to build on," he said. "We have a moral responsibility to tell the truth. This is the Cheyenne truth." Reporter Martin Kidston can be reached at 447-4086, or at mkidston@helenair.com. Hi, I realize this article is over 10 years old, but a correction needs to be made- Black Kettle did not die at Sand Creek. He died almost exactly four years later, at the battle/massacre at Washita River, in which Custer led the attacking U.S. forces.